Thats is interesting – I was not aware that kernel_task was supposed to be that small! Mine is around 1.2GB pretty much all the time, using ATI 6870. So.. how can I tell which kext is using which portion of the memory? And what with drivers from latest 10.8 build? The problem might be that VideoHardwareAcceleration is not enabled withe the most nvidia cards. We all taking often about opencl but i bet more user would profit from VDADecode. Would really appreciate if someone find bin patch or a other method to get it working. I already tryed some suff but failed. Labo Apple - Une fuite de mémoire sur les pilotes Nvidia ? VDADecode would be really fine. i also have tested a lot of things, but i think we need a bin-patch to make it work of. /// loaded doesnt mean attached&handling device. Will Mountain Lion support unflashed PC GPUs in real Macs? I have seen claims that some has used a 6870 unflashed in a Mac Pro in Lion, is this possible? 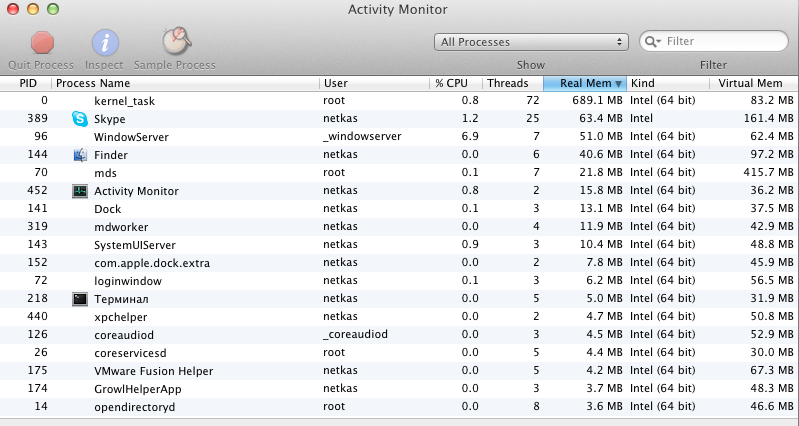 200MB for a kernel_task is incredible for Lion, maybe in Snow Leopard could be. On my Mac Pro 5.1 with official ATI 5770 without any hacky kexts kernel_task is 692 MB so I think this is normal. With both 10.7.x and 10.8 I have the same behaviour. mid-2010 (6,2) MBP 15″. After a fresh reboot, kernel_task consumes around 400MB – some hour later its up to 520MB. 3 days later i’m sitting around 850-900MB…and so it goes on until I reboot. This has to be a known issue.